10 best cookbooks you must read before you get married - Recipe books! Why do we earn? Have you ever asked this question to yourself? Majority of us would answer, to help the family, support parents, fulfill dreams and shape future for kids. Well, the answer is simple and we earn to eat. Yes, you eat to survive in this cruel world testing your passion every now and then. More than half of the world population has the urge to learn cooking, whereas the other half is happy buying meals for themselves. Cooking has emerged as a passion for some and duty for others. Today, we have numerous options available to pursue our hobbies. Cooking, being one of the hobbies pursued by majority especially young women who are about to set their foot in the married world. Marriage comes with a lot of duties, out of which cooking is considered to be one of the prime focus areas. We live in a strange world where men wish to marry a woman if only she knows how to cook. Well, today tables have turned my friend and woman stand up front asking the same question to their would-be-life partner- “Do you know how to cook?” Cookbooks come handy in learning basic cooking skills. Some of the best cookbooks, you must read before you get married has been discussed below to help the young ladies and even gentlemen to cope up with the demands of life. Why do you need a cookbook? Majority of the world population has been living their lives in a matchbox-sized room, and eating cold storage food. There comes a time when the hostellers want to eat something which reminds them of home. Yes, cookbooks serve beneficial in satisfying the hunger for good food. The tech-savvy world relies on the best cookbooks to navigate through the ups and downs of life. There are various cookery shows broadcasted on the television, which looks fancy to the viewer. However, there are a handful of people who make note of recipes while watching cookery shows. Therefore, the cookbooks are the best option to serve the hunger and passion together. Everyone isn’t an expert in cooking, as someone once said – “Cooking is an Art”. Yes, you need to master the art of cooking mushrooms. This is one of the best cookbooks you must read before you get married, which teaches you the easy way to bake, grill, and sauté mushrooms. The author has photographed the best mushroom recipes across the globe to lure you in the magic shrooms. This is one of the best cookbooks which guides reader to the African diaspora and a journey of two renowned chefs. This cookbook would help the user to understand Afro-Asian-American blend of food. The book helps to guide through multicultural cuisine in a single recipe. The book holds recipes not only for big nights but for every day and week nights to serve the people better. This cookbook is one of the best recipe books for Indian curries. The author was born in Mumbai, moved to England for higher education landed in the culinary business. In this cookbook, she has shared some of her favorite regional recipes from Indian cuisine. This cookbook includes some of the amazing food photo shoots ranging from Madras lamb curry to Bombay prawn curry. In this cookbook, the author has clubbed two concepts together to help out foodies who are enthusiastic travelers. There are over 250 recipes curated in the best cookbook by the author, focusing on different regions of India. There are chapters where one can find exquisite Goan cuisines and Himalayan delicacies. The book is more than just a cookbook; it is a guide with recommendations for places to stay, restaurants to eat and shopping destinations. However, the beetroot curry and coconut chutney remain personal favorite of the author. You would have often heard people claiming that vegetarian food is boring. Here, this cookbook is the answer to this claim. The author aims to provide vegans with delicious vegan recipes through her cookbook. Tofu scramble for breakfast table, potato quinoa for lunch box and Goan curries for dinner table conversation- all in one recipe have been provided in this best cooking book for housewife. Desserts drive craziness in people. There are television shows luring the sweet tooth inside you. This cookbook is the solution to the dessert cravings. It is one of the best cooking books available for desserts with more than 90 recipes curated by the author. The book aims to help you master secrets of patisseries and hone the baking skills. The recipes are also accompanied by expert advice and striking photography of crispy croissants and gateaux. Mug cakes are answered to the utensil crisis in the household. However, these mug cakes are the next big sensation in the world of desserts. With the help of few ingredients and a mighty mug, you can create magic as described in the best cooking book. The recipe book consists of step-by-step instructions and photography to guide the users. People around the world are a fan of Indian cuisine, ranging from the street food to the five-star hotel lip-smacking food culture. The author has curated some of the famous recipes from India celebrating the richness of culture and heritage of the country. It is one of the best recipe books consisting of delectable starters, mouth-watering desserts, achars and chutneys across India. The book is the detailed journey of the author to India and the Indian cuisine. It is one of the best cookbooks by the author depicting the Indian cuisine. 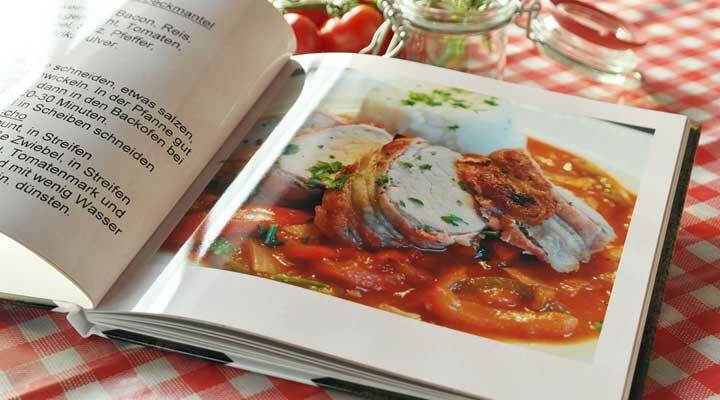 The book has been divided into different sections such as street food, curries and sea-food for every palate. The book inspires the readers to try one of the dishes described by the author. A Kati roll with pickled onion is one of the recommendations by the author. Nigella Lawson is one of the favorite chefs across the globe, with her easy to make recipes. The book is all about using food leftovers in the fridge to satisfy midnight cravings. It is one of the best recipe books to help out beginners in the world of cooking. The book has also been described as Instant Nigella Classics. The world of food and culinary is not confined to geographies and borders. It is growing wider with the passage of time. There are amazing cookbooks to guide you through different cuisines, testing your palate. There are coffee table cookbooks, and dietary cookbook by the celebrity authors inspired the world to eat healthily and cook variant cuisines. With the help of some of the best cookbooks, each one of us can become a wonderful chef in our kitchen. The use of telecommunications has lowered the book business as there are videos available on the internet to guide people. However, the readers continue to rely on cookbooks for assistance. I love finding new recipes it’s so important to learn how to cook and explore new ways to cook. That mug cake book looks awesome! I love the mug cake book! My fiance doesn’t care for desserts normally but only eats them when we make them at home. Some great cookbooks here. I’m an avid collector but don’t have some of these….I feel a hopping spree coming on! I think everyone should learn how to cook and feed themselves regardless of their marital status! These are great books. That’s something that I definitely would have liked as a wedding present was a cookbook because I was completely lost lol Thanks for sharing. I am not getting married anytime soon but these cookbook suggestions are awesome! I will be definitely looking into getting some of these.